The Venerable Chris Skilton spoke ahead of a London conference, Where is My Older Neighbour? which will take place on 9 October and explore the role of church communities in caring for an ageing population. It is being held by MHA, the national charity providing accommodation, care and support for 16,000 older people, along with the Project for Seniors and Lifelong Ministry and London Churches Social Action. Other speakers will include Chief Executive of Care England, Professor Martin Green. It will be chaired by Pam Rhodes (pictured with Sir Terry Wogan at the National Rotary Conference), presenter of BBC’s Songs of Praise and Patron of MHA. Professor Green said, “Church communities have a valuable role because they are diverse, represent all ages and are local to the community. They are places where older people can discuss and debate issues. Pam Rhodes said, “We have much to learn from this older generation who have been through so much in their lives so that we can enjoy peace and comfort in ours. We owe it to them to put into place a structure which provides care for the elderly which is right in every way – mind, body and soul. Where is My Older Neighbour? 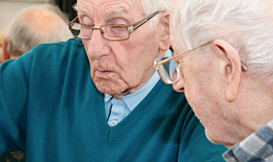 is open to anyone concerned about later life issues in a church or community setting and older people themselves. For more information, please call 0113 272 8471 or e-mail Rachel.Walker@mha.org.uk. You can also follow the Twitter hashtag #olderneighbour.